I was very impressed with the win of Aircraft Carrier at Wolverhampton on Monday evening when our selection landed a gamble (5s into 7/4) and was cut from 14/1 to 10/1 with BetVictor for the Marathon on All-Weather Final’s Day (April 19th) at Lingfield Park. The French won the corresponding race last year with Funny Kid (8/1 with BetVictor for a repeat) but marginal preference at this stage is for another Gallic raider Amade (7/1 with BetVictor) who impressed me enormously when scoring at Kempton earlier in the month. Believe it or not but there is rain – albeit not much – forecast for Newbury this afternoon although conditions are likely to be no worse than good for today’s six-race card. Ar Mest (1.10) has been raised 6lbs for his recent Leicester win, but will be ridden by 10lbs claimer Niall Houlihan this afternoon and meets the runner up Percy Street on 8lbs better terms taking into account the jockey’s allowance. En Meme Temps was well held when second at Wetherby on Boxing day, but this five-year-old can race from the same mark this afternoon and remains open to considerable improvement. Harambe (1.40) jumped superbly here before tiring late on when the combination of 2m 4f and soft ground proved his undoing. He is a confident selection to get off the mark this afternoon for Alan King. Do note the six-year-old finished third in the Aintree Bumper last spring. 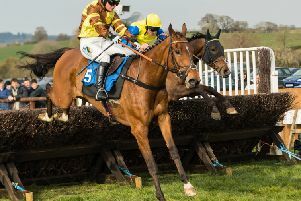 Le Precieux will have his supporters as he chases a quick hat-trick for Gary Moore, but I felt Charming Zen (2.15) ran well in defeat at Hereford on his chase debut where he jumped as if a return to a left-handed track would suit. That effort was his first in 325 days and his first for Olly Murphy. Horatio Hornblower won the Harwell Trophy 12 months ago for Nick Williams and has his chance of following up from a 3lbs higher mark later today although softer ground would have suited. Ben Pauling saddles a couple and the each way vote goes to Powerful Symbol (2.50) who has a poor completion record for one who is a good jumper of a fence. A trip just shy of 3m on good ground is, arguably, his optimum conditions and I feel he can run a big race from the front. Midnightreferendum (3.20) is taken to follow up her Fontwell win for Alan King whose mare finished runner up in the Aintree Mares’ Bumper back in April. Her winning form is with plenty of cut and any of the forecast showers would be a positive. At Plumpton, Kilfinichen Bay (3.10) is not the most consistent horse in training but, if on a going day, he is well up to defying his current mark and gets the vote in the Veterans’ Chase for Charlie Longsdon whose 11-year-old was well supported before scoring at Sedgefield on his penultimate start. Back on the flat and I will be disappointed if James Street (3.00) does not go very close in the 6f handicap. The selection finished runner up at Kempton last time when he had a 103-rated horse behind at level weights. With that in mind, he looks well treated off a mark of 88 today on his handicap debut and first start at Lingfield.